Mona Lisa Pilon is proud of where she lives and is happy to show it off. “Whether it was a good day or a bad day, you got a bed,” she told CBC Toronto as she recounted other simple comforts like heating and a clean bathroom. Pilon became homeless last year. But now, along with 25 other women, she can call the Mary Sheffield House home. 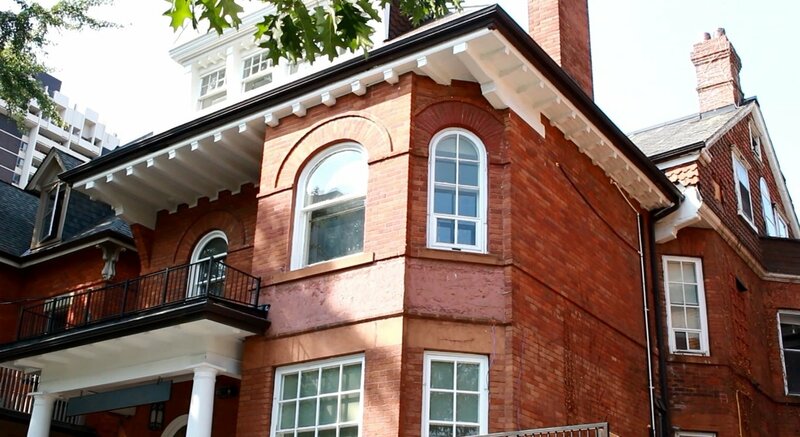 The red-brick Victorian mansion at 512 Jarvis St. north of Wellesley Street underwent a top-to-bottom renovation over the past year and now provides 25 units of transitional housing for women over 55 leaving the shelter system. “We’re human beings and we want to be housed, to continue whatever life we have left,” Pilon said. The transformation of the home was a joint effort by Fred Victor, a social services organization for homeless and low-income people in Toronto, and the owners of the property, Mike and Giulia Ahmadi. They named the home after Mary Sheffield, who founded a downtown mission to help the poor and destitute, and battle the social problems that plagued Toronto in the late 19th Century. The Ahmadis had originally purchased the three-storey home for themselves. But they realized the space could be re-purposed into something with a bigger impact. “You see the ladies, their eyes full of tears, and they say, ‘Thank you.’ I don’t think you can buy this with any amount of money,” said Mike Ahmadi. The Ahmadis hired contractors and paid for the renovations themselves. Working with Fred Victor, the organization identified older homeless women who had been involved with the group and who were in need. Mark Aston, CEO of Fred Victor, said the idea had been in development for the past two years and explained how the home can help older residents. “Many of these units are fully accessible; there’s an elevator that’s been installed,” Aston said. While Fred Victor hails the opening of the Mary Sheffield House as an example of community benefactors helping Toronto’s homeless population, several neighbours on Jarvis Street and in the surrounding area took Fred Victor and the Ahmadis to court. The concern was purportedly that transitional housing could bring more homeless people to the area. With precarious housing and shelter space among the major concerns for Toronto city council heading into the winter, Wong-Tam said this home will serve as an example to developers. Additionally, Wong-Tam says the complainants should “take another look” at the transitional home because their fears have not come true. “These are women who have been down on their luck, where they have been forgotten by society, where they have an opportunity to turn around their lives,” she said. The Ahmadis and Fred Victor have won their legal battles and are now hoping the new residents can get on the road to recovery. “There’s a lesson here,” said Giulia Ahmadi. Original article on CBC website can be found here.